I just returned from a magical week in Kauai with my partner Jeff and am feeling revived, refreshed, inspired and serene; all of the perfect qualities necessary to begin 2010! From our balcony at the Hanalei Colony Resort, on the north shore of Kauai, we had this magnificent view of the great mother ocean. One day we drove to the west side of the island to see Waiamea Canyon, otherwise known as the “Little Grand Canyon.” The drive was twisty and turny, and definitely worth it! It was absolutely breathtaking!!! 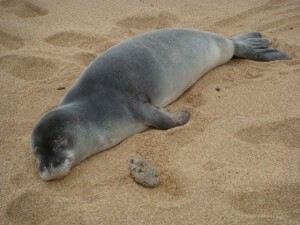 Several times on the beach we ran into our friend the Monk Seal taking a snooze and soaking up some sun. Monk Seal’s are high on the endangered species list and I felt honored to be in such close proximity to this awesome creature of the sea! Then from Ke`e Beach to Hanakapia`ai Beach we hiked through some lush jungle-like scenes, and after our first mile we were rewarded with this stunning view of the Na Pali coastline. After crossing a slippery stream we came upon Hanakapiai Beach. A sign along the way warned us not to swim in the ocean here as the rip currents are deadly and there were tally marks denoting the total number of drownings; we got the message! 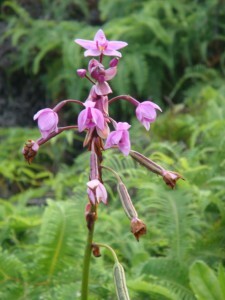 So instead of swimming, we had a nice picnic, made a couple of Cairns to mark our spot and headed back to the trail, of course stopping many times along the way to take photos like this this one of a beautiful orchid. This island has magical powers and is very seductive. I am so happy that I was able to experience it’s beauty with Jeff and I know that we will return! Excellent! If I could write like this I would be well happpy. The more I see articles of such quality as this (which is rare), the more I think there might be a future for the Net. Keep it up, as it were.